Get to know the history of the Spanish emperors by visiting the place from where they ruled the world for three centuries, and the place where they are buried. 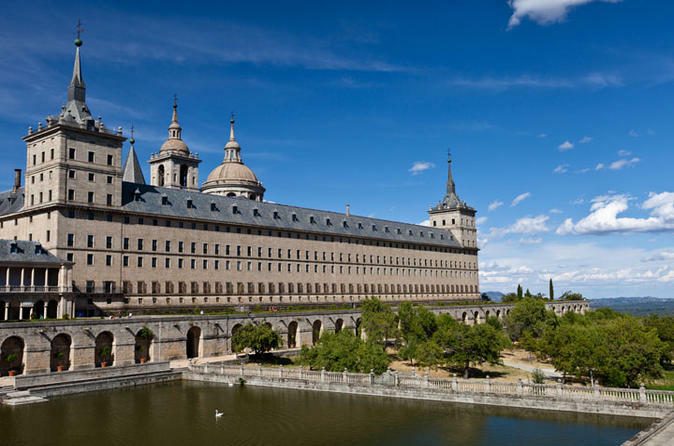 With the extensive walking tour inside the Monastery of El Escorial, totally explained by a professional guide, get a better understanding of a long part of the World history. Also visit the impressive Valley of the Fallen, and get amazed by the views from its Basilica, raised in the heart of the mountain, and by its Christian cross, the largest in the world. Enjoy a complimentary pick up in selected hotels to the departure point, located in the center of Madrid.The departure from Madrid will be at 8:45 am, in an air conditioned coach to arrive in the city of El Escorial, located in the mountain range of Madrid to visit the impressive Monastery of El Escorial, and its unique Basilica. At arrival, complete walking tour inside the Monastery and Basilica, visiting its most important chambers, through the different sections: the library, the palace of Felipe II - the emperor that raised the Monastery, the palace of Bourbons, and, of course, the crypt, where the emperors are buried. Afterwards, brief transportation on motor coach to admire the impressive Valley of the Fallen. Climb up to the Valley of the Fallen Basilica, raised in the heart of the mountain. Free time to get overwhelmed by the views and the largest Christian cross, 150 meters high.